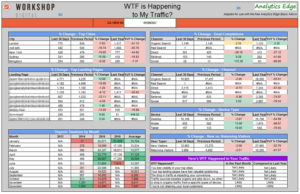 Joe Kelly of Workshop Digital created this custom dashboard to easily analyze what is causing organic search traffic to decline, and I adapted it to work with the free Analytics Edge Basic Add-in. Just enter your Google Analytics view ID number and refresh. Read the original Workshop Digital blog article with a Google Sheets version. This entry was posted in A. E. Basic Add-in, A. E. Core Add-in, A. E. Standard Add-in, Google Analytics on 2016/06/13 by free reports.